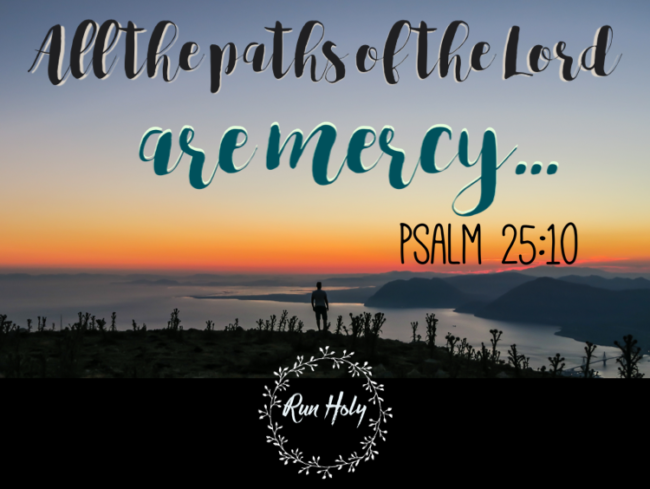 I recorded a scripture meditation from a special psalm where I discovered GOD’s Mercy Paths. Psalm 25 is a great psalm when you’re looking for life direction or wisdom on specific life choices. It talks about “bringing our life to God”. It says that God “teaches the humble His way”. It’s humility that drives our eyes upward during important times of transition. Only the humble seek God’s counsel on direction. The prideful think they’ve got it all figured out. The humble seek God’s advice as a vital necessity. I’ve come to this humble realization through a bunch of prideful life choices which took me through some hard knocks. When I was searching for answers on my future husband and God’s will for my life, Psalm 25 became a very special place for me. I remember those times of seeking on the back desert plains of west Texas. I remember the freedom I found within the walls of this psalm. There was so much fear surrounding making the “right choice”. As I had learned before, God’s will is not a tightrope but a playground. Yes there is a fence and boundaries but there is fun and freedom. If we feel we are walking a tight rope when making choices, that is not freedom. That’s not what He means by the narrow way. I believe the narrow way is actually found in the small daily choices of obedience and devotion. These actually matter more to God than the “big choices”. I found freedom in psalm 25. In verse 10, He says “all the paths are mercy”. Within our humanity and unique personality we will journey and digress down complex paths. He works all these paths together for our good and for the future that we have hoped for. When we look to Him and wait in hope for His direction, we will never be put to shame. Mercy will cover every choice we make. Down every path we will find mercy. His goodness will follow us Dow EVERY path we choose. We don’t have to be afraid about choosing a wrong path because all the paths we walk down seeking him along the way are mercy. He will instruct “sinners” in His way it says in verse 8. Isn’t this an interesting verse? Especially since it follows verse 7 which talks about Him remembering no more our sins. The theology of that is very complex but also simple. I think the gist of it is this: God is good. In his mercy, he teaches even those that have sinned against him. Psalm 25 was a sweet chapter of encounter for a season of my life. Do you have those sweet spots in every Bible? I included two versions in this meditation because they were both so rich. Good Versus Best: Have You Chosen God's Perfect Will for Your Life?